From privately-owned helicopters to helicopters that serve offshore oil rigs, from air ambulances to military troop carriers, we supply a very wide range of easily-installed, environmentally-friendly, non-powered, photoluminescent signs designed to fulfil the functions you would expect and probably a number you might not. Our saf-Tsign® products for helicopters include the all the classic informational signage - no smoking, fasten your seatbelt and exit (whether as text or the graphic). But for helicopters specifically, we also supply ‘push here’ markers. Why? Because helicopter windows are designed to be pushed out to provide an emergency evacuation route in the event of it ditching for whatever reason. If that does happen, it’s obviously very important that passengers can see what they have to do, even in the dark. For commercial customers, including OEMs in both Europe and North America, we supply signs and decals in a range of colours, even ‘glo’ colours, as well as a range of finishes, not only gloss and matt but wood and leather effects. On the subject of finishes, we have also developed wipe-clean surfaces with an anti-microbial finish where hygiene is very important in air ambulances. In addition, we can supply them with informational signage for a specifically medical environment, such as signs to indicate where the oxygen cylinders are located. 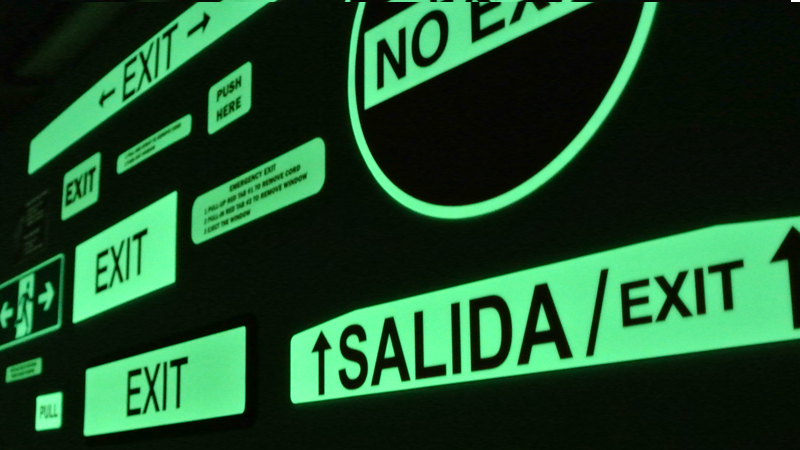 The military represent another important market for our helicopter signage, and one of the main reasons for that is that our photoluminescent signs work very well with night vision systems. We can make them NVIS (Night Vision Imaging System) Friendly or NVIS Compatible – which basically means that the signs won’t cause flaring in the crew’s night vision goggles whether in the cockpit or in the back of the helicopter. A critical feature of our saf-Tsign® technology for a very specialised application. In short, we can design signage for just about any application that a customer may require it for. And one if the great benefits of our signs is that they are self-adhesive, high performance, high reliability and essentially, fit-and-forget. If a saf-Tsign® product is there, it’ll work.